Recently author Elizabeth J. Rosenthal asked me to review her newest publication, “The Life of Roger Tory Peterson”. I contacted my friends at the Roger Tory Peterson Institute (www.rtpi.org) who raved at how accurate Elizabeth was able capture Mr. Peterson’s legacy. They stated some of her research was done at the institute ( so that was a plus for me before even starting to read the book) but she had also collected interviews with a hundred of Roger’s closest colleagues. Elizabeth has a special way of projecting his life and what I liked most is her approach on how important conservation was in every project he was involved in. Peterson’s writing, painting, photography, science and moviemaking had a way of truly affecting many of our lives in different ways. Reading this bibliography is the perfect way of appreciating everything Peterson did for naturalist around the world. One of Peterson’s childhood teachers (Miss Hornbeck) gave him a Louis Agassiz Fuertes print from the Birds of New York and some water colors . . . (Question) What species of bird did Roger need to replicate in the Fuertes print? Many years later a few paintings of Petersons were accepted to be displayed at the American Ornithological Union (AOU) meeting where he had the opportunity to meet Louis Agassiz Fuertes in person. (Question) What item did Fuertes gave to Peterson at that meeting ? 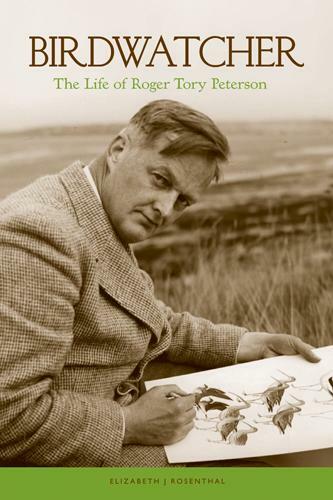 The first person to post the correct answer to both questions will get this copy of “The Life of Roger Tory Peterson”!!! I know one of my subscribers will have this wonderful book on their bookshelf . . . . I sure hope you make it a point to read the book also! This entry was posted on 9 January 2009 by mon@rch. It was filed under Nature, Ornithology . Hey stranger. I don’t have an answer for you but I’m sure someone will have it. Are you digging out from under several feet of snow? I don’t have any answers either but you’ve enticed me enough that I’m going to pick up the book the next time I’m at the book store! Blue Jay and Fuertes gave him one of his brushes. Haven’t visit this site in awhile. I believe the answers are: Blue Jay & slim red sable paintbrush. But…I’ll hint to my husband that I’d like it for my birthday. Good to “hear” from you again. Others have already guessed answers, and –let’s be honest–I wouldn’t know anyway. Just good to read something from you. Mon@rch, thanks for the heads-up on this. I’ve just requested it from my library and I’ll look forward to reading it.